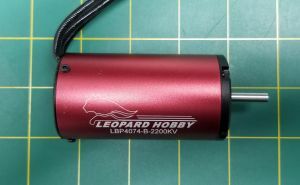 40mm Diameter by 74mm Long Brushless Motor by Leopard Power. Hand wound for high efficiency of up to 90%. FREE Water Jacket with Leopard 4074 Motor Purchase! We offer this in 6 versions. Watts: 1500 with Over 2600 Burst. Leo motors fit the bill. I have an old school Dumas Deep Vee 40 fiberglass hull and had a Hobbyking 4084 1050 kv with a CNC 54mm prop, HK 180a ESC on 6s 5000mah. I"d get about 5 min run time and about 45 mph top speed. Not bad at all for this heavy beast! One of the best. Put some BOCA bearings in and they purr. Great ability to rev and even the 2200KV can accept 6S for a while.